Having a retirement plan for your company is a benefit to all including the business and the employees. As retirement plan advisors, we will work with you to design the retirement plan that is best suited to meet the needs of your company. 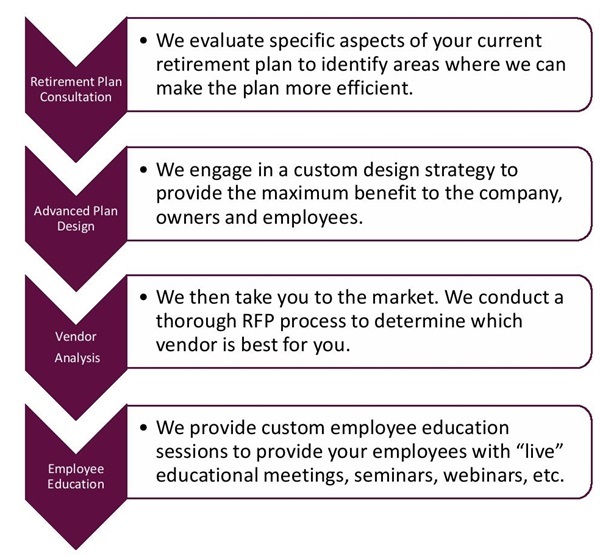 We work directly with the plan sponsors or fiduciaries to learn how we can serve you. Our goal is to ensure that the retirement plan is designed in the most efficient way possible to enable the company and employees to obtain the maximum benefit. We explore different retirement plan types and service models to determine which will best suit the company and the employees. Whether you are the self-employed, a small business owner, a non-profit organization or a corporation we can design a more efficient retirement plan or implement a new one.